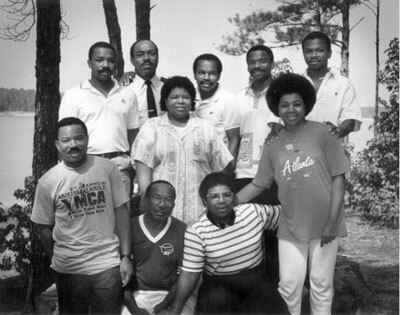 Starting in rear-left: Bruce K. Jackson, Charles B. Jackson, Carl D. Jackson, Toney E. Jackson, E. Scott Jackson, (standing middle) Veronica R. Jackson, (front row) M. Don Jackson, (squatting) Carletha Jackson and Marian Jackson, and (standing) Carletta F. Smith. Photo from “Celebrate ’88,” immediate family reunion (of Carletha and Marian Jackson off springs) at Hickory Knob State Park, SC in July 1988. We would like to invite the public to join Trinity Community Church as we celebrate our 156 years of ministering in the Edgefield community. Sunday May 19, 2013 is the Big Day Anniversary with two services. The first service will be held during our 10:00 morning worship service. The Jackson family will be the guest speakers. They all grew up in the Edgefield Community and attended Trinity Church. At the present time, they all live in different states and several of them are involved in ministering. Trinity’ former first female pastor, Wanda Austin, will be present in this service. The second service will begin at 6:00 pm. This is the service where we are expecting our elected government officials (senators, mayors, councilmen, sheriff, police chief, representatives, and etc.) The guest speaker will be Pastor Tom Dimarco from Episcopal Church of the Ridge and Dr. Robert A. Williamson Jr. with the Edgefield Baptist Association will be on program to rededicate Trinity Community Church back to God. Thomasina Adams Dais, president of the Old Edgefield District African Genealogical Society, will be sharing Trinity’s history. Trinity Community Church is located at 403 Mims Street in Edgefield and everyone is invited.